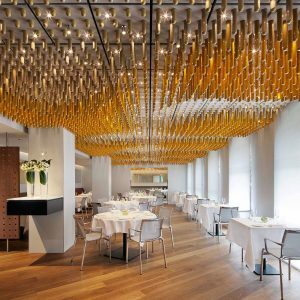 Brief: to design a new restaurant for the Halkin Hotel bringing together the Basque heritage at the heart of the Arzak cuisine and the contemporary design of COMO Hotels. 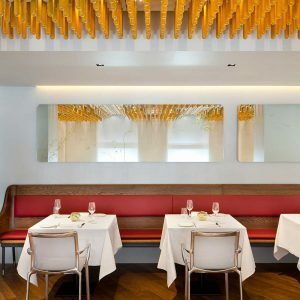 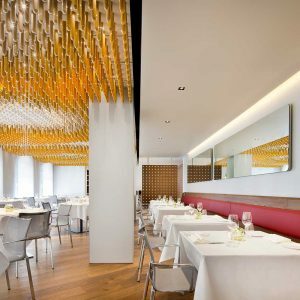 Our design response for Ametsa took inspiration from the raw design and warm materials at the original Arzak restaurant in San Sebastian, and the tranquility of The Halkin Hotel, to create a culinary oasis that makes visual reference to the earthy flavours and techniques used in the chefs’ unique cooking style. 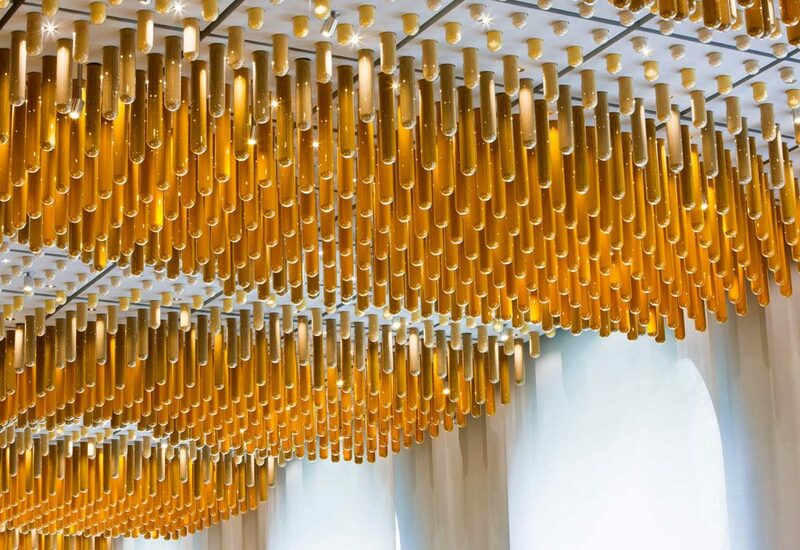 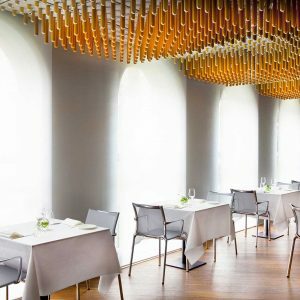 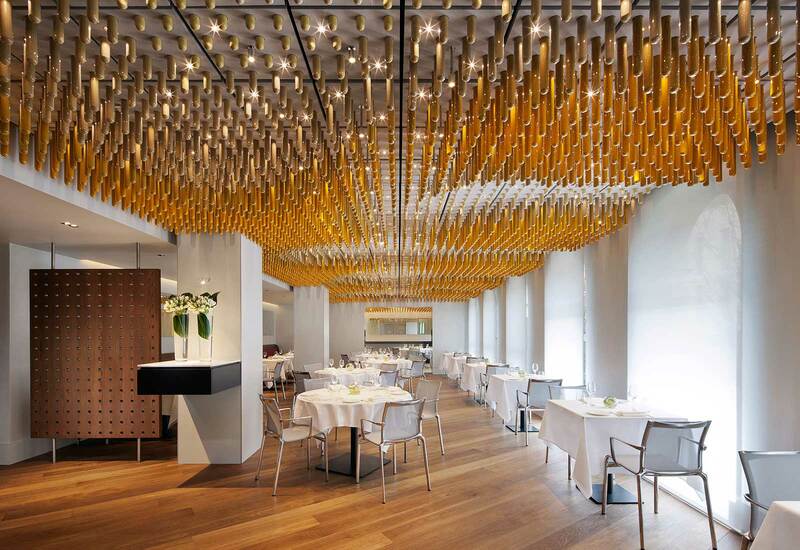 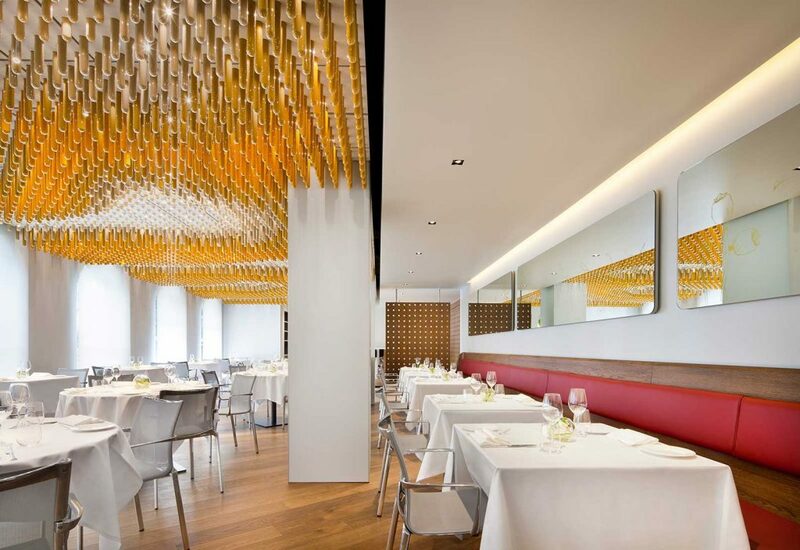 The focal point of the restaurant is a wave-like ceiling, created from seven thousand delicate glass receptacles filled with the vibrantly coloured spices that are a strong presence in Arzak’s cooking. 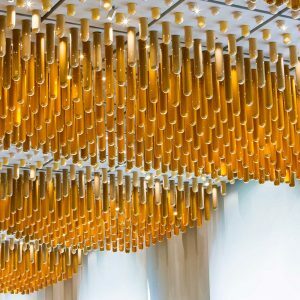 Part sculpture part chandelier, it forms a warm glittering canopy, while the ceiling raft that carries it also functions as an acoustic baffled to absorb sound and create an atmosphere of intimacy. 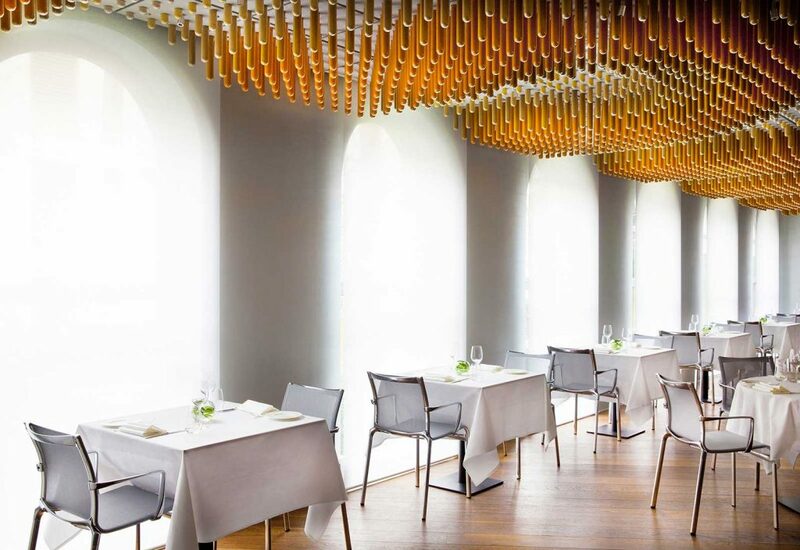 To compliment this dramatic centre-piece a series of mirrors along one wall are engraved with botanical illustrations of the herbs and spices encased in the glass-tubes. 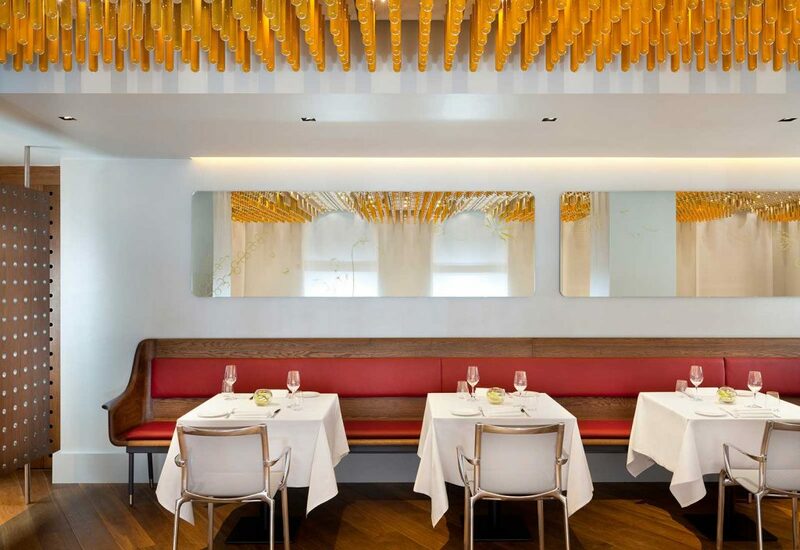 Fumed oak benches line the walls. 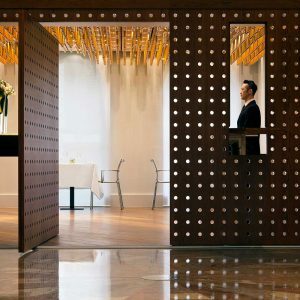 Large perforated doors partially screen the restaurant from the entrance lobby, the perforations picking up the grid of the ceiling, while an oak floor laid at a 30 degree angle invites diners into the space and delicate lacquered walls define a subtle, serene interior where the food will always be the star. 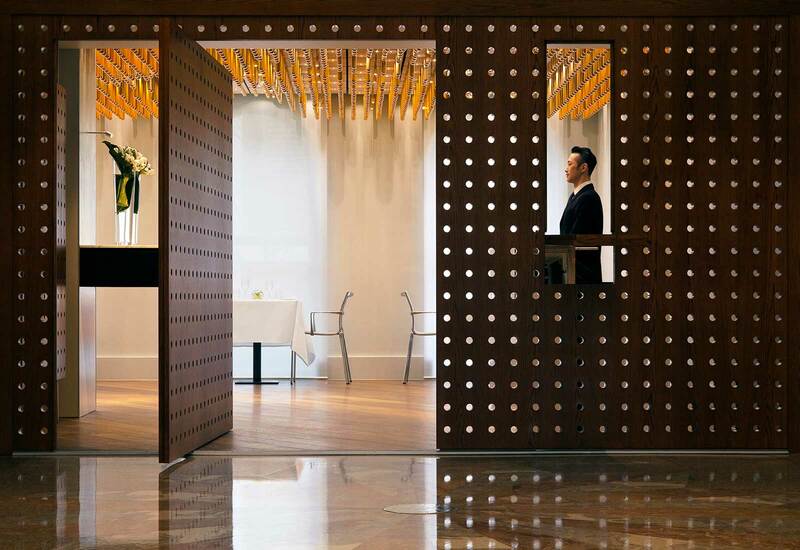 A private dining room can merge with or detach from the main restaurant via sliding mirrored doors.